The first of three growing popular event that brings together first, second and third generations Grenadians in the diaspora saw hundreds meeting, greeting and networking as they seek to become more acquainted with each other and at the same time learn more unique information about the island. 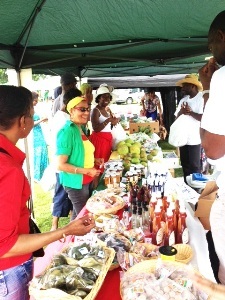 On Saturday 13 July 2013, Grenadians in the United Kingdom came together to celebrate the 5th Annual Grenadian Heritage Day. 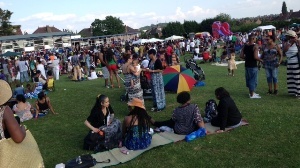 A massive crowd of Grenadians and friends descended on the Old Lyonian Sports and Social Club in Pinner, Harrow, where they sampled tasty Grenadian cuisine, fruits, vegetables, arts, craft, culture, entertainment, as Grenada’s Heritage was put in the spotlight. The idea for this event was conceived in 2009 by the High Commissioner for Grenada, H.E. Ruth Elizabeth Rouse, and is aimed at educating second and succeeding generation Grenadians about their Heritage, and showcasing Grenadian Culture, Expertise and Cuisine. Since the first event proved to be a tremendous success, the High Commission, together with the Grenadian Community Groups in the United Kingdom, decided to make it an annual event. A press release from the Grenada High Commission in London said that the Day was Officially Opened by The Worshipful The Mayor of Harrow, Councillor Nana Asante, who warmly welcomed Grenadians to Harrow. Several Grenadian Community Groups, individuals and supporters showcased their talent with an array of dishes, artistic creations and a wide range of performers in a variety of disciplines, including carnival costumes. The Diaspora Youth Forum (DYF) UK took the opportunity to increase the awareness of Grenada’s Heritage and hosted a corn-roasting stall. Grenadians came from various parts of the United Kingdom including Manchester, Reading, Wales, and from several communities in and around London. High Commissioner Rouse was high in praise for the Chair of the Heritage Day Committee, Mr. Claude Sylvester, and his team, for their dedicated service to Grenada, in planning and executing the event. Special thanks also went out to the stall-holders, sponsors in the UK and Grenada, including The Grenada Board of Tourism (UK); Virgin Atlantic, who donated the first prize for the raffle, a return ticket to Grenada; The Grenada Marketing and National Importing Board; Grenada Distillers Ltd., among others. The proceeds of the event will go towards a chosen Heritage-related Project in Grenada. The 6th Annual Grenadian Heritage Day will take place on Saturday 12th July 2014. Grenadians in New York will be celebrating Grenada Day on Sunday 21 July 2013 at St Andrew’s Park (between Atlantic & Kingston Avenues), Brooklyn, New York; while Toronto will celebrate on 24 August 24 2013 at Coronation Park.